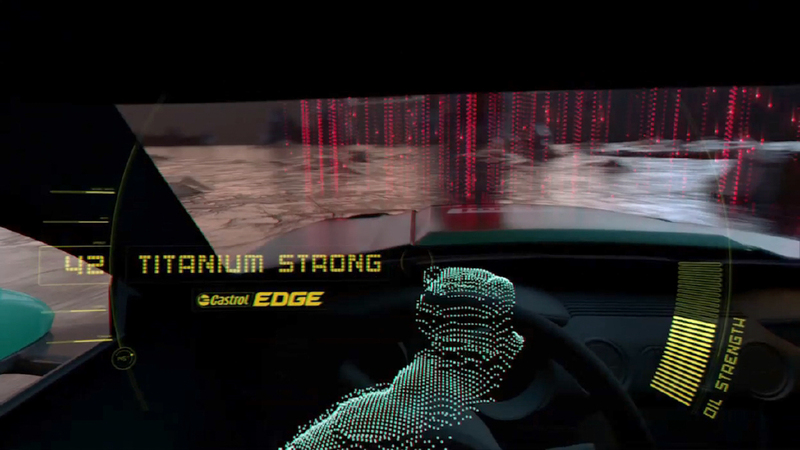 Imagine a high adrenaline scenario that combines video game technology with real world driving skills and the result is this latest Titanium Trial by Castrol EDGE, a project dubbed Titanium Strong Virtual Drift. 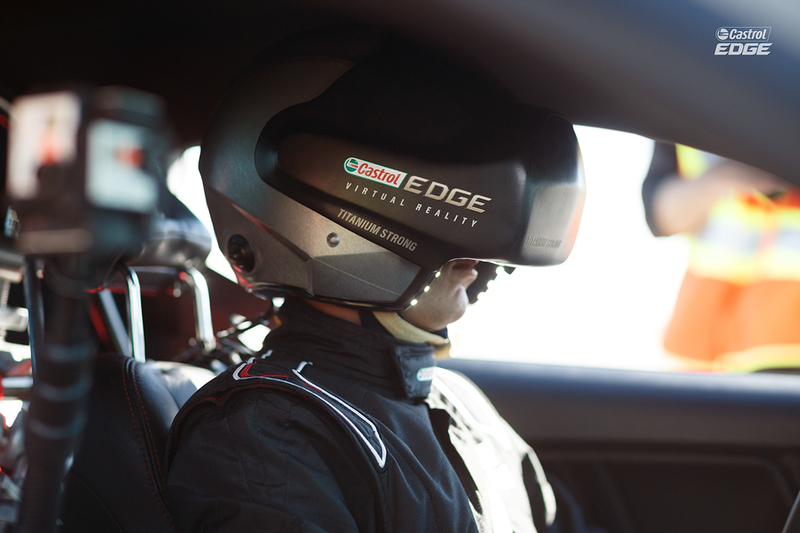 Both scary and exciting, this video demonstrates the skilled prowess of pro drifter Matt Powers using a state of the art Oculus Rift Development Kit 2 headset on closed course. 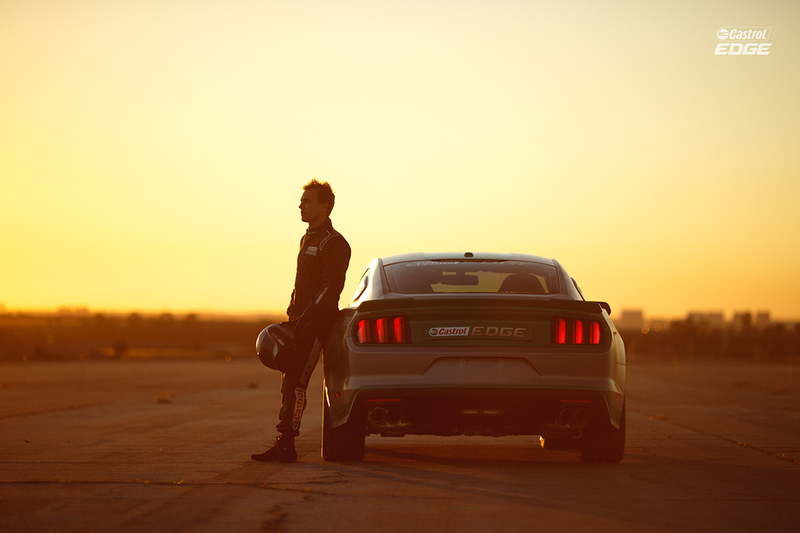 Matt's blind to the real world, relying solely on Oculus' ever-changing 3D virtual world to guide his course as he pilots a Roush Stage 3 Mustang on Nitto NT555 high performance tires to the finish line, and as he moves along the virtual world also reacts to his and the car's movements in real time. 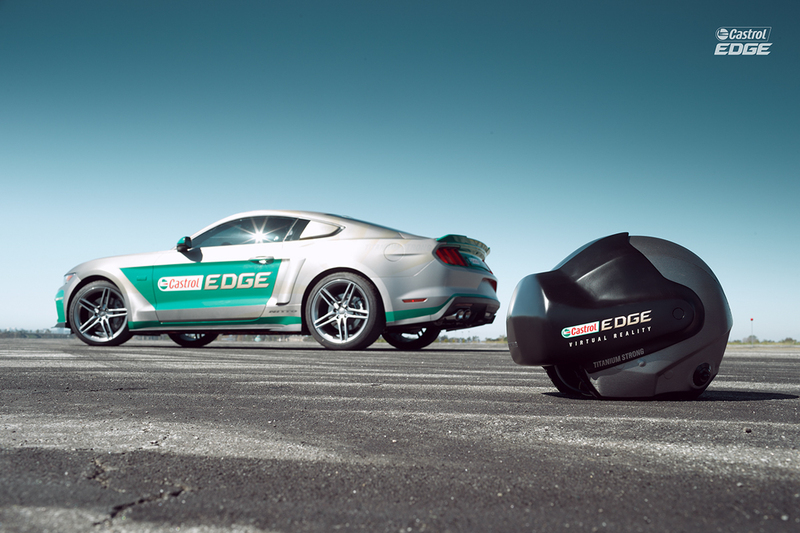 Check out Matt Powers as he puts the Roush Mustang into action for the Castrol EDGE Virtual Drift: We caught up with Matt shortly after his Castrol EDGE Virtual Drift experiment to have him breakdown what driving experience was like because we couldn't believe something like this was possible, yet Oculus has already done the impossible! 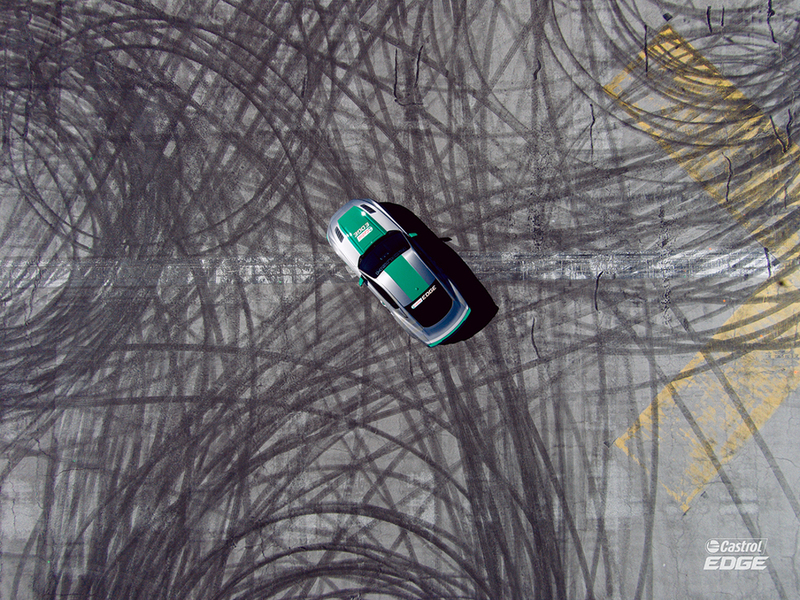 Driving Line: When Castrol approached you with the concept, what were your initial thoughts on virtual driving/drifting? Matt Powers: At first I don't think I really even realized the full scope of the concept. I was definitely down and crazy excited at the opportunity, but it took a few weeks and even a few days of involvement to fully realize the extent of everything they were trying to do! The idea of driving a real car as a controller to a video game! Definitely took a little while to get my head around it all. DL: From both a driving and creative perspective, what did it take to develop a project like this with Oculus? 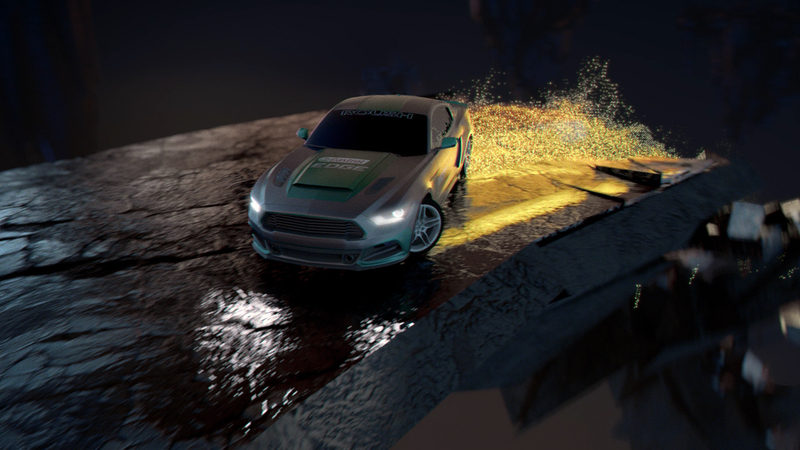 MP: Driving-wise I simply drove the course and around the obstacles designed in the game. Development wise this was a huge project. The creation of the physics of the game and the creation of the aesthetic in the virtual world were definitely huge undertakings. The game is designed to be as close to reality as possible, with throttle, steering, wheel speed, yaw, g-forces, brakes and more, all being read and calculated by a huge computer in the back seat, which then takes the data and virtually projects into my custom Oculus helmet as to where I would be at the moment in the virtual world. Furthermore, El Toro, our location, was geo-plotted by land surveyors to allow my team to place the virtual world "on top of the track", so that spatially everything was on par. This was only the tiny tip of the iceberg! DL: What is the sensation like, knowing you need to rely on Oculus as you’re actually driving? Was it designed to keep you on the pavement the entire time? Any moments where you felt nervous? MP: It was definitely designed to keep me on the pavement. During the testing period there were times I was off-course in the game but in reality I was on-course. The torque curve was difficult to match. Maybe the car's alignment would be a tiny bit off and make the car veer in reality but that didn't overlap in the virtual world. So it was tough, but mostly practically, not virtually. To rely on Oculus is very scary and it definitely wasn't my idea to actually to try to drift it for the first time (only after a few days of normal driving testing with it on). I was nervous for sure! I also needed earbuds from the walkie communication just to be 100% positive I would be able to hear the command to shut it down if anything went astray. DL: Could you see this being something for the future of motorsport/drifting? MP: I think there is definitely a future for it and the game is really cool in that you can drive the virtual world with the car actually being still the entire time, leaving it in park and using the gas and brake makes the car move in the virtual world. Where it will go is hard to say but it's pretty cool!